William Pedals On: Non-circular Chainrings: Paradise or Placebo? Non-circular Chainrings: Paradise or Placebo? Several of my riding companions have recently experimented with non-circular chainrings. As an anecdotal observation, most of them report a performance improvement and none have reverted to their original circular rings. There have been several well-publicized results on non-circular chainrings in the last few years, most notably the Tour de France wins by both Bradley Wiggins and Chris Froome. Interestingly, however, Tim Kerrison, head coach at Team Sky, claims that credible research that has been undertaken is inconclusive. The question then arises: are these scientifically proven benefits or a placebo effect? This article attempts to summarize current thinking with the disclaimer that I have not yet tried non-circular rings myself. The idea is very simple: design and orient chainrings that allow the rider to spend less time in the least powerful parts of the pedal stroke, when the cranks are vertical, and more time in the most powerful parts of the pedal stroke, when the cranks are horizontal to the ground. That is, minimize the negative effect of the so-called “dead spot” which is the point at which the cranks are vertical and neither leg is generating any significant power. The single parameter that captures this idea is known as “crank angular velocity” which remains relatively constant throughout the pedal cycle with circular chainrings. A non-circular chainring varies the crank angular velocity within the pedal cycle which, in turn, alters the time spent in each segment of the pedal cycle. To translate this into practical terms, the chainring should have a larger radius at the stronger segment of the pedal stroke and a lower radius at the weaker segment. Bicycle engineers have been aware of the dead spot for over a century; non-circular chainrings were first tried back in the 1890s. The most notorious experiment in recent years was with Shimano’s Biopace rings (1983 to 1993). Recent studies claim that the downfall of Biopace was caused not by the shape of the rings but by their orientation. 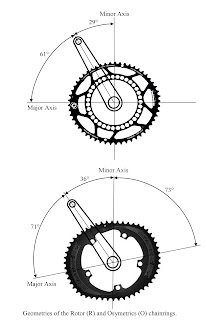 There are several parameters that are relevant in non-circular ring design: the number of teeth, the “eccentricity” of the rings (the ratio of the major axis to the minor axis) and their orientation relative to the crank arms (including adjustability that allows rings to be “dialed-in” to the specific rider and bicycle set-up). The various manufacturers of non-circular rings, for example Rotor, OSymetric, Bionicon and Absolute Black, all put their own particular spin (is there a joke there?) on the different variables. There have been a myriad of papers written on the subject, not all of them independent and unbiased. Researchers have examined the physiological and performance differences between non-circular and round cranks on numerous occasions. Though there are some that report improvements of up to 6% with non-circular chainrings, a majority have concluded that, for efforts longer than one kilometer, there’s not much difference between round and non-circular chainrings. None reported a decreased performance. Additionally, not all authors are even agreed on the appropriate output parameters to be measured: speed, power output, lactate threshold, heart-rate etc. In support of the use of non-circular rings for high-intensity events, an IJSSE study based their conclusions on a 1 km time trial study over a six-week period, using eight competitive male cyclists and triathletes using Rotor Q-Rings. Performance measures during the time trial were based on time to completion, speed and power output. In addition, physiological measures (oxygen consumption, heart rate, blood lactate were also monitored over the time span of the study. The authors concluded that the Rotor Q-Rings provided a positive effect in the time trial and speculated that they could also prove beneficial in criterium-style racing events or at the end of a road race in which bicycle racers typically pedal at similar intensities and durations as the 1 km test. (“Effects of Chainring Type (Circular vs. Rotor Q-Ring) on 1 km Time Trial Performance”. Christiane R. O’Hara et al. International Journal of Sports Science and Engineering. September, 2011). Studies at the University of Utah, while not challenging the fundamental premise behind the use of non-circular chainrings, addressed the issue from the perspective of joint-specific kinematics. The author concluded that use of non-circular chainrings did not either enhance or compromise joint-specific (collectively, the hip, knee and ankle) performance in trained cyclists. (“The Influence of Non-circular Chainrings on Maximal and Submaximal Cycling Performance”. Chee Hoi Leong. Department of Exercise and Sport Science, The University of Utah. December 2014). The anecdotal evidence in support of non-circular chainrings, though not compelling, is certainly intriguing. Perhaps they are at the same stage of development and general acceptance as clipless pedals, integrated shifters and mountain bike suspension were in their early days …. innovations that are now regarded as de rigueur. Nevertheless, it would appear that objective scientific experimentation in support of the use of non-circular chainrings is somewhat lacking and there is unquestionably no measure of consensus among the various researchers. At the end of the day perhaps we need to just accept that even a placebo has the potential to offer a significant performance gain. · Not all of the various manufacturers’ non-circular rings fit all cranks. Be sure you understand your crankset’s spider pattern, bolt circle diameter etc. · All front derailleurs are optimized to work with round chainrings and some degradation of mechanical performance might result with non-circular rings. In this regard, front derailleur fine-tuning might a tad more finicky. · The risk of dropping a chain appears higher with non-circular rings so consider installing a chain catcher on the front derailleur. · Because non-circular chainrings change the angular velocity of the crankarms and thus the power transmitted to any power-meter strain gauges that yu might use, any historical power data from your prior use of circular rings cannot be compared to the data set from the new rings.